Loneliness, dreams, romance, and a spark of whimsy -- these are the perfect ingredients for any cinematic tale of love. Fueled by a high energy, impressionistic style full of innovation and experimentation, Paul Fejos' 'Lonesome' is just that. Made during the unique transitional period before "talkies" completely took over Hollywood, the movie is primarily a silent effort, but does include sound effects and three scenes of actual dialogue. While these talking sequences prove to be rather superfluous, the rest of the picture is a genuine delight. The director takes a simple story and infuses it with visual and emotional exuberance, coming away with a joyful gem of classic moviemaking. Mary and Jim (Barbara Kent and Glen Tryon) are two lonely individuals who trudge through the monotony of their hectic jobs. 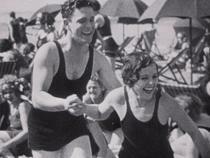 During a rousing Fourth of July celebration in Coney Island, the pair meets, and instantly forges a connection. Love struck, they enjoy the festivities and get to know one another. Unfortunately, a mishap on a rollercoaster separates the duo and soon the massive crowd works to keep them apart. Though distraught, they fight to reunite. The plot is exceedingly simple, but full of charm and magic. The ordinary, daily routines of the characters are explored, presenting an entertaining medley of contrasts and similarities. Before they meet, Mary and Jim's lives are juxtaposed against each other, drawing humorous parallels between the former's graceful morning routine, and the latter's chaotic scramble out of bed. This comical correlation continues throughout their work day, highlighting differences and commonalities between them. By the time they each light up with child-like glee upon hearing a band playing music outside their windows, it's clear that they were made for each other, even though they've yet to actually meet on screen. From there, the narrative takes on a playfully romantic tone as the couple finally gets together, flirts, and instantly falls in love. Silly, fleeting misunderstandings are dealt with easily before culminating in real drama, and throughout it all the filmmakers and performers place an appropriate emphasis on physical bits, facial expression, mannerisms, and pure visuals, highlighting all of the strengths of the silent film art form. Director Paul Fejos fills the movie with an exuberant explosion of style and cinematic innovation. Dynamic moving shots add an exciting sense of energy, and superimpositions layer visuals on top of one another, building an impressionistic aesthetic that adds a dash of whimsy to otherwise ordinary situations and people. One particularly impressive sequence features a rotating clock superimposed over images of Mary and Jim at work. While they go through the motions of their daily routine, time ticks away slowly, literally ever present on the screen. All the while, the juxtaposing images of their separate jobs appear to slide in and out of the frame, seamlessly transitioning between locations through a clever editing effect, maintaining the connection between the two without the use of traditional cuts. Not an exact replication of reality, Fejos slightly exaggerates the world his characters inhabit, creating an impossibly crowded and overstuffed environment for his lovebirds to navigate through. A few scenes even feature some color tinting, with specific objects hand painted with simple hues, adding bold splashes of vibrancy to the carnival atmosphere. A faintly surreal, fairy tale mood is also engendered, and in one particularly striking shot, the two dreamers are shown dancing in the clouds with a castle behind them. Another scene sees the couple sitting in an ethereal void cast in a purple hue, seemingly lost in time as they lament about their past loneliness and dream about the future. As magical as the whole experience is, the film's three dialogue scenes are sadly lacking. Seemingly forced upon the production, the talking sequences are out of place and hurt the momentum of the story. Likewise, the writing is lacking in these instances, and while the performances are decent enough, the talking just isn't necessary. Everything that's said aloud is already perfectly expressed through visuals alone, making the speech completely redundant. Still, these scenes are an interesting novelty on their own and certainly don't ruin the movie. They just end up demonstrating exactly why dialogue isn't always needed. 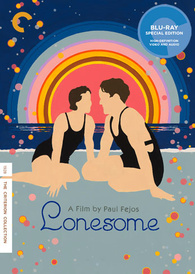 Capped off by the type of ridiculous, ironic coincidence that can only work when filtered through the romantic prism of cinema, 'Lonesome' is a quintessential example of simple, joyful storytelling that's elevated through an inventive, impressionistic style. Full of creative cinematic techniques, this hybrid of silent film and talkie hints at the future of the medium, anticipating many stylistic hallmarks that later directors would expand upon. The dialogue sequences may be more of an amusing curiosity than a necessity, but they mark an important transitional period in the history of motion pictures. Despite its melancholic title, the film really isn't about loneliness at all -- it's about the moment when isolation comes to an end, when solitude gives way to companionship, when ordinary dreamers meet upon a stage of silver screen magic. Simple yet extraordinary all at once, 'Lonesome' is a genuine cinematic treat. Criterion presents 'Lonesome' in their standard clear case with spine number 623. The BD-50 region A disc comes packaged with a booklet featuring essays by Phillip Lopate and Graham Petrie, along with an excerpt from a 1962 interview with Paul Fejos. The film is provided with a 1080p/AVC MPEG-4 transfer in the 1.19:1 aspect ratio. Despite its rather rough condition, the ingenuity of the filmmaking shines through brightly. Considering its age, the print is in OK shape, but damage is apparent throughout with scratches, specks, dirt, vertical lines, and other signs of deterioration almost always in abundance, along with a coarse layer of grain. Thankfully, though certainly apparent and consistent, the damage isn't a huge distraction and there are some stretches (particularly later on) that look a bit cleaner. Detail wavers from scene to scene, with the majority of the picture looking quite soft. With that said, there are a few shots that show off nice clarity and depth (a scene featuring falling confetti is especially impressive). Contrast is high and a little blown out, and blacks are deep and consistent. Though primarily in black and white, there is some color tinting in select scenes, and the simple hues are actually quite striking. 'Lonesome' can look very rough around the edges, but that's to be expected for a film of this age. The inventive cinematography and imaginative visuals are impressive regardless, and though it's far from pristine, the quality is definitely acceptable. The audio is presented in an English PCM mono track with optional English subtitles. Much like the video, the mix shows some definite signs of age, but still gets the job done just fine. Though primarily a silent film, ambient sound effects are heard throughout and there are three dialogue scenes. For the most part, these "talkie" sequences actually sound quite nice with decent fidelity and clear speech. Unfortunately, the overall mix has a very thin, hollow quality with strained music and effects. Range is flat and there is some background hissing. There is also notable distortion in the score. Despite these issues, the music itself is lovely and though the mix isn't in the best shape, it still sounds just fine. There are unavoidable limitations when dealing with material like this, and given the circumstances, this is probably the best the film could hope to sound. Criterion has put together a very strong collection of supplements, including two additional films from the director (one of which is actually longer than the main feature). All of the extras are presented in 1080p with Dolby Digital audio. Commentary with Film Historian Richard Koszarski - Richard Koszarski provides a very informative track full of production details. 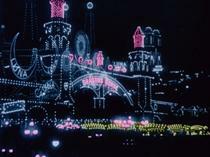 The film's impressionistic visual style, influences, and themes are discussed along with details on the movie's inventive filmmaking techniques. The director's other works are also referenced rounding out an insightful commentary full of interesting analysis and historical facts. Fejos Memorial (HD, 20 min) - This is an audio autobiography recorded by Fejos in 1963 where he reminisces about his life and career. A montage of stills plays out as the director discusses his rather fascinating path toward and then away from Hollywood, with his later years spent in documentary filmmaking and anthropology. The Last Performance (HD, 1 hr) - Paul Fejos' 1929 silent film, 'The Last Performance,' is included in its entirety. The condition is quite rough and faded, but is still very watchable. Like 'Lonesome,' a sound version with some dialogue scenes was produced, by this cut no longer exists. Telling the story of a deadly love triangle between a magician, his assistant, and protégé, the film is decent and features a good performance from Conrad Veidt. Though more conventional than 'Lonesome,' it's still worth a look and is home to a few interesting moving shots. Broadway (HD, 1 hr & 44 min) - Fejos' 1929 film, 'Broadway,' is also included in its entirety. Originally released in both silent and sound versions, the sound version is presented here. Unfortunately, the last reel of the talkie cut is missing, so the silent version is substituted for the last few minutes with audio elements taken from a private collection. Most famous for its innovative roving shots that relied on a specially designed crane, the film is home to some truly impressive and highly influential camera work. The story itself, focused on an entertainer couple who unwittingly get caught up with bootleggers, is pretty basic, however, and not that engaging. The quality of the print isn't great either (the Technicolor finale is disappointingly rough), but is still acceptable . Likewise, the sound levels are inconsistent. Still, the reconstruction work done here is commendable, and it's wonderful that the film is included. Hal Mohr on Broadway (HD, 7 min) - A 1973 audio interview with Hal Mohr, the cinematographer of 'Broadway,' is included. Behind-the-scenes stills and clips play over the interview, as Mohr elaborates on the complicated crane and nightclub set used in the production. 'Lonesome' is a beautiful, simple tale about two dreamers falling in love. Director Paul Fejos packs the film with an inventive and dazzling sense of style and innovation. It's dialogue scenes are superfluous, but they offer an interesting peek into a unique transitional period in moviemaking. The video and audio are both rather rough, but that's understandable given the age of the material, and the artistic strength of the visuals and music shines through. Criterion offers a great set of supplements, including two additional features from the director and a commentary. The film itself is a real treasure, and while the supplemental movies aren't as strong, the fact that they're included here is absolutely wonderful. While I wish the print was in better shape, this is still a strong disc for a joyous film. Recommended.